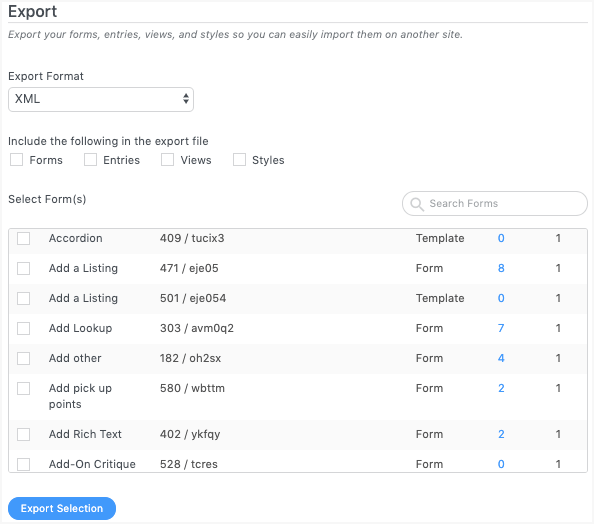 You may easily export Forms, Entries, Views, and Styles from the 'Formidable' > 'Import/Export' page. The exported Forms, Entries, Views, and Styles can then be uploaded to any site that uses Formidable. You may also export entries as a CSV file, and then import this file into any application that accepts CSV files, like Excel. Go to your 'Formidable' > 'Import/Export' page. Typically, you should select 'XML' for the Export Format. However, if you only want to export entries, select 'CSV' instead. Exporting entries as a CSV file is especially helpful if you want to modify the exported data or import it into an application like Excel. If you select 'CSV' as the file type, it is recommended to select 'UTF-8' as the encoding type. Select the Data to Export. Note: In the free version, only forms can be exported, so this option will not appear. Select one or more forms to export data from in the Select Form(s) field. Click Export Selection. Your browser will download an XML or CSV file which can be imported to another site, imported into another application, or modified and imported back to the original site in order to update data. If you would like to export a few selected entries, entries that match a search, or all entries for a particular month, follow the instructions below. Go into the form that you would like to export entries from and click the 'Entries' tab. Select a few entries or do a search for a particular value. If you want to search for entries created in January 2014, select 'Entry Creation Date' in the search dropdown and type 2014-01 in the search bar. If you did a search and only want to exported matching entries, just click the 'Download CSV' button. If you selected entries to export, then select 'Export to CSV' in the 'Bulk Actions' dropdown and click 'Apply'. If you would like to export a Style and import it to another site, follow the steps below. Select 'XML' for the Export Format. Select 'Styles' for the Data to Export. Find a form that has the Style you want to export selected in the form's Settings > 'Style Template'. Select this form in the Select Form(s) field. Click Export Selection. Your browser will download an XML file which contains the exported Style. When you open a CSV in Excel, Excel will use default charset settings and ignore the encoding type in the CSV file. Sometimes this results in abnormal characters appearing in your Excel spreadsheet. If you import the file into Excel instead of opening it normally, then you can select the encoding type/charset. We recommend using the Excel > Import option and selecting the encoding type that corresponds with the CSV encoding type, which is typically UTF-8.